Olentangy’s Sean Marks (12) launches a three-pointer over Orange’s Luke Ballinger during the first half of Friday’s OCC showdown in Lewis Center. The Olentangy boys basketball team needed two three-pointers – each with a high degree of difficulty – to earn its first OCC-Buckeye win, 75-74 in overtime at rival Olentangy Orange to open up the new year Friday night in Lewis Center. Adam Wiff’s skip pass to Alex Sieve was deflected, but not far enough away. Sieve collected it in the right corner and fading left sunk the go-ahead three-pointer with 2.3 seconds left in overtime. Sieve wouldn’t have gotten a chance had Sean Marks not banked in a buzzer-beater to tie it 67-67 to send it to overtime. Marks and Sieve each hit three threes in the game for Olentangy (6-4, 1-3). Marks used a 9-for-10 effort at the foul line to help him to a game-high 31 points. Jerred Kinnaird had 17 points and Sieve chipped in 11 for Olentangy. He hit his other two threes as a part of a 9-2 run in the second quarter that helped Olentangy create some distance on its way to a 33-24 halftime lead. But, Orange responded in the third with a pair of Luke Ballinger threes, a third by Matt McCollum and a McCollum three-point play that tied it 38-38. But, Olentangy responded with four quick points on a Kinnaird basket and two Marks free throws and led 42-38 with 3:01 left in the third. Olentangy led 46-43 through three. 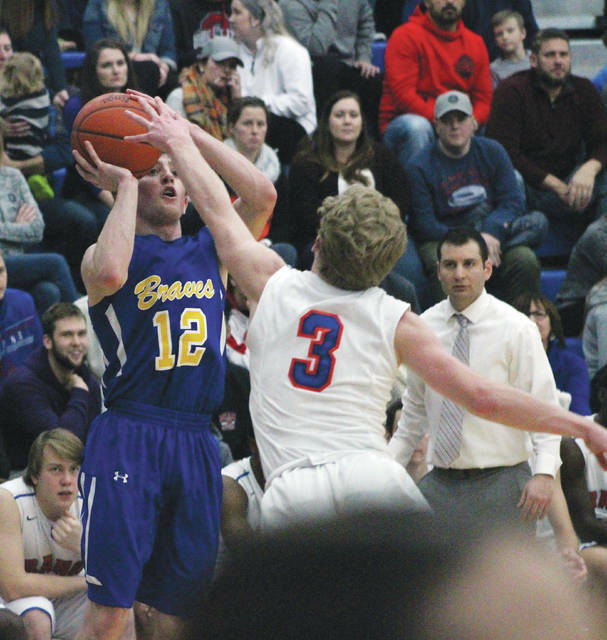 Bryson Lane tied it with three-pointer to open the fourth, but Olentangy again responded with four quick points. Austin Brown’s three gave Olentangy a five-point lead midway through the fourth. But, Orange fought back again. Ballinger knocked down the tying three with 2:47 left and a Jalen Bethel and-one finally gave the Pioneers the lead at 65-64 with 1:31 left. Bethel was key down the stretch, scoring 11 of his 15 points in the fourth quarter. Olentangy cut it to one on a Wiff drive-and-score before two Lane free throws set up Marks’ tying bank-shot. Manny Anderson’s steal-and-score gave Orange a 74-72 edge in the final 20 seconds of overtime before Sieve knocked down the game-winner. Anderson scored six of his 11 points in the overtime period to lead the Pioneers. Feasel chose not to call a timeout to set up a play on his team’s final possession. McCollum had 20 points and Ballinger finished with 17 on the strength of five threes to lead Orange (9-3, 2-2). Both teams take on non-league competition next. Olentangy is right back at it tonight at 7:30 p.m. at Dublin Coffman while Orange hosts Hilliard Davidson Tuesday night at 7:30 p.m.
https://www.delgazette.com/wp-content/uploads/sites/40/2018/01/web1_marksoo.jpgOlentangy’s Sean Marks (12) launches a three-pointer over Orange’s Luke Ballinger during the first half of Friday’s OCC showdown in Lewis Center.